This is an absolutely fantastic novel that is unfortunately a little bit confusing in the beginning, especially if you haven’t just finished reading the first novel, Amber House. Sequels can be a tricky business, and in this case, readers need to know a number of things before starting this fantastic novel in order to follow along. The first novel takes place in the present that readers know, understand, and live within. But when Sarah alters the fate of a family member at the end of the first novel, she ultimately alters the entire world. It’s like the butterfly effect. Change one event in the past, and the entire history is rewritten. Thus begins Neverwas. Though it feels like the story takes place in the 1940s, it’s actually present day. However, the country has been split up into different provinces, the civil rights movement never happened, and the war between the US and Nazi Germany is on this world’s doorstep—except now Germany is attempting to take over all of the provinces and stake a claim in the US. Sarah is just a few months older in this world than she was in Amber House, but her family is tightly knit and she’s in the midst of an openly racist country—with a few activists attempting to bring down not only Germany, but also jump start the civil rights campaign. It is all very intriguing, but difficult to follow in the beginning because there is no mention of the alternate reality until about 35% in, when the house begins to make Sarah remember. 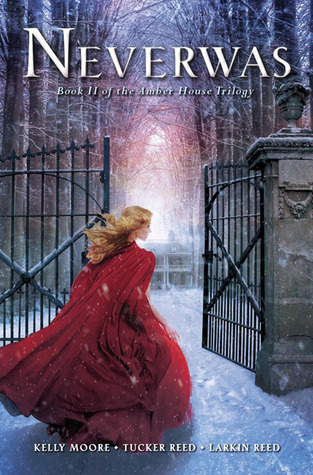 Now, I loved Amber House; I gave it five stars, and even I struggled to get into this sequel because I couldn’t make heads or tails of the initial story. There are no references to the past, the timeline is not established, and there is no “info dumping” at the beginning of the novel, which many sequels utilize in order to remind readers about previous events in another book. Putting all these aspects together creates a bit of a recipe for disaster, and truth be told, I nearly set this novel aside because I couldn’t figure out what was happening, and from looking at other reviews, it seems I am not alone in my confusion. However, I kept with this novel, and in the end, I really, really loved it, especially once Sarah began to remember and the house began to speak to her once again. Everything became clear to me around 35%, which in truth is a bit late in the game to finally be making heads and tails of a story, but I am so glad that I kept with it. This alternate reality is a horrible place to live, and Sarah, her family, and her friends all know it. In fact, they’re trying to change the present through the resistance, but only one person can actually change the present back to its original form, and that is Sarah. But the going won’t be easy. Thwarted by those who know about Amber House and want to decimate its existence, Sarah much act quickly in a world fraught with danger if she is ever to change the world back. This novel revolves around the butterfly effect, and its mystery stems from Sarah’s final actions in Amber House. How did Sarah’s actions change events so drastically that it negatively impacted history as we know it? The truth can be found within the pages, and if you keep an open mind as you read, thinking about the butterfly effect and knowing that Sarah unknowingly changed the course of history, then I believe you’ll really love this novel, just as much as I did. Five stars. Scholastic and Arthur A. Levine Books have been extremely gracious in allowing me to read an ARC of this novel prior to its release on January 7, 2013.